Under which circumstances should a wrist joint replacement with an artificial component (prosthesis) be considered? What medical conditions may lead to a total destruction of the wrist joint? Could injuries lead to the destruction of a wrist joint? Could infections also destroy a wrist joint? Is it possible for a wrist joint to get destroyed by a radial fracture? Generally speaking only when severe damages to the wrist joint exist which cannot be corrected otherwise. A wrist joint may be destroyed by a fateful osteoarthritis which develops out of the same circumstances as also seen in knees and hip joints. 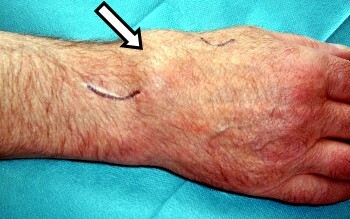 The image shows a healthy wrist joint with well-visible joint line. Advanced osteoarthritis between scaphoid bone and radius. The image to the left shows a healthy wrist joint. The space between radius and scaphoid bone corresponds to the cartilage which cannot specifically be displayed in an x-ray. The image to the right shows an advanced wrist joint osteoarthritis. The cartilage between radius and scaphoid bone is completely destroyed. Bone rubs against bone! 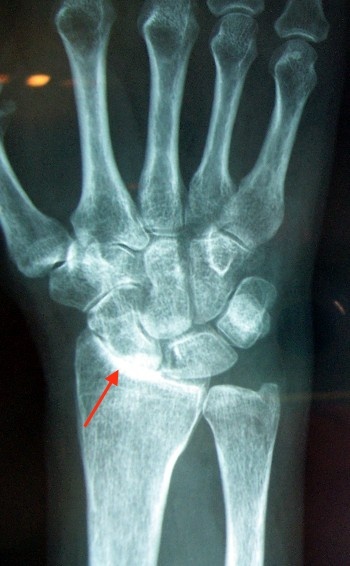 A wrist joint may be destroyed by a rheumatic condition (chronic polyarthrosis). 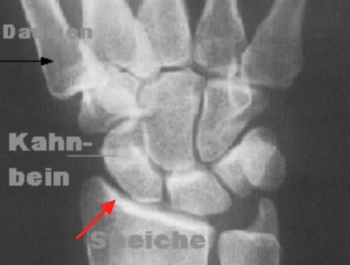 An advanced stage of Kienböck´s disease may also lead to the total destruction of the wrist joint beyond any chance of reconstructive correction. Yes, in many case scaphoid bone fractures which did not heal properly are responsible for the total destruction of a wrist joint as these unhealed fractures may lead to severe osteoarthritis in the long run. Not healed scaphoid bone fracture with subsequent wrist joint osteoarthritis. 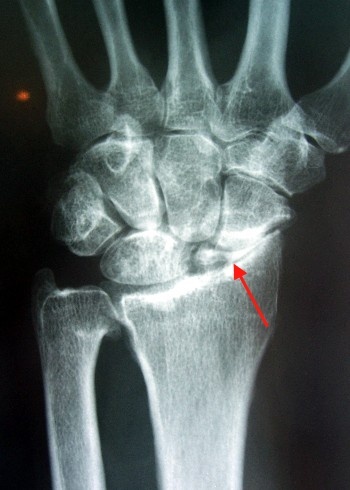 The not healed scaphoid bone fracture seen here (red arrow) over the years lead to a severe, very painful wrist joint osteoarthritis. Even damages to the ligaments in a wrist joint over time may lead to severe osteoarthritic conditions which may destroy the wrist joint entirely thus causing considerable pain. Yes, this is possible. However the destruction of a wrist joint due to an infection is the least probable one to occur amongst the causes mentioned before. As applicable to any other joint, infections may travel through the blood from any other infection source into the wrist joint causing heavy damages, particularly if detected late. Likewise an infection may also directly occur through an injury or an animal bite. If the infection is treated too late even the administration of antibiotics may not save the joint from total destruction. Yes, the radial fracture is one of the most commonly seen fractures in humans. Radial fractures may vary considerably from one another. If the joint surface gets destroyed this may lead to a very painful osteoarthritis on the long run. Patients suffering from strong wrist joint pains typically push very hard for a surgical solution as they are not willing to take drugs over extended periods of times (risk of side effects). The radial fracture seen here shows the misalignement and wrist joint osteoarthritis very easily even with the bare eye.